Heat about 1/2 Tbsp butter and 1/2 Tbsp of olive oil in a pan over medium heat, just to the smoke point. Add a good handful of fresh sage to the pan. Sauté until sage is just starting to wilt. Add 2 boneless, skinless chicken breasts to the pan. Brown for 3 to 4 minutes on each side. 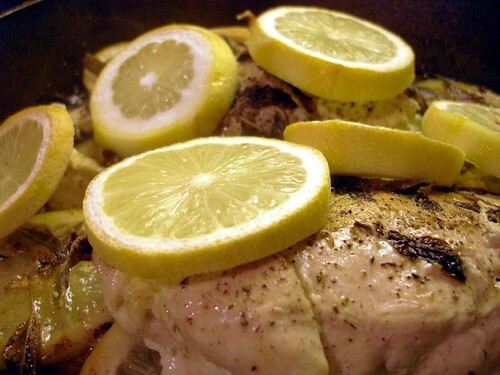 Cover the chicken with lemon slices. Place pan in oven and cook for about 30 minutes, until chicken is cooked through. I so can\’t wait to get our kitchen back online. This looks delish. BTW – the restaurant I see the Mariner\’s in is Matt\’s in Redmond Town Center. It\’s across from Cucina. For a suburban restaurant I really enjoy it. They have a good oyster bar, good drinks, decent happy hour and all around good food. I even saw Jeff Nelson at the restaurant below Matt\’s.